Under the technical development programme formulated in April 1919 by General Duval, the newly-appointed Directeur de l'Aeronautique, two categories of turbo-supercharged fighter were called for, one single-seat and the other two-seat. The two-seater came within the CAP, or fighter-reconnaissance, category, and Hanriot's contribution to this programme was the HD.15, which, designed by Emile Dupont, was flown for the first time at Orly in April 1922. This competed with the Gourdou-Leseurre GL-50. 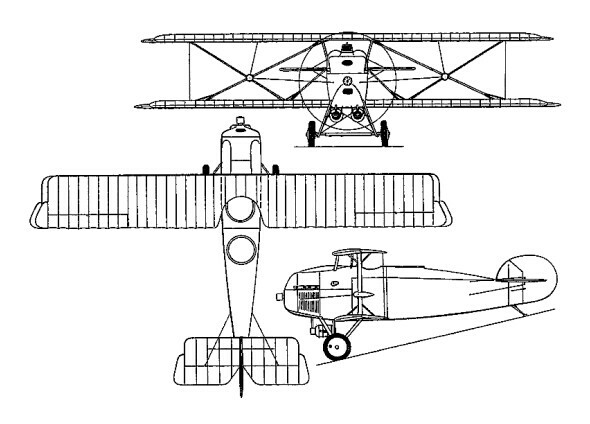 The HD.15 was a tandem two-seat, unstaggered biplane employing rigid-X type interplane bracing. It was powered by a 300hp Hispano-Suiza HS 8Fb eight-cylinder water-cooled engine equipped with a Rateau turbo-supercharger which was intended to maintain sea level engine power to 5500m altitude. Armament comprised two fixed forward-firing 7.7mm Darne machine guns and two weapons of the same calibre on a swivelling mounting in the rear cockpit. In the event, the CAP category had been discarded before the flight testing of the HD.15 commenced and the entire turbo-supercharger fighter programme became something of a fiasco as a result of unavailability of the Rateau unit in quantity. However, the Japanese Army had begun to show interest in the potentiality of turbo-supercharged engines, and purchased the prototype HD.15, which was delivered in 1926. An order was placed for three identical examples of the HD.15, but, in the event, the vessel delivering the aircraft was struck by a tidal wave and the HD.15s never reached Japan.